Discussed below are the top reasons to choose NodeJs for web app development. Easy Modification and Maintenance: Previously built applications are not adaptive and become rigid over time as new modifications arrive. By the time they start creaking under the functionalities they were not built for. However, making a scalable application that can be modified at a later stage is comparatively easier using NodeJS. A bunch of small applications is built instead of a large application that allows making changes or adding new functionality with much ease. Simultaneous Request Handling: NodeJS provides the non-blocking I/O system that lets you process multiple requests concurrently. The simultaneous request handling will be much better than other languages like Ruby or Python. It will queue the incoming request and execute them sequentially in a fast manner. As a result, your application will take less system RAM, have high scalability levels and will perform better and faster. Freedom in Building Apps: While other frameworks like Ruby On Rails impose specific rules and guidelines for developing the software in a particular way, NodeJS gives complete freedom and free space to carry on the development process in your own way. It completely allows you to start building everything from scratch. It executes basic tasks giving you the bare minimum from a fresh install making it less restricted. NodeJS is the best choice as the technology if you are looking for real-time web apps as it provides all the features and functionalities to deliver outstanding performance. It also creates excellent APIs and handles the requests that demand scalability. 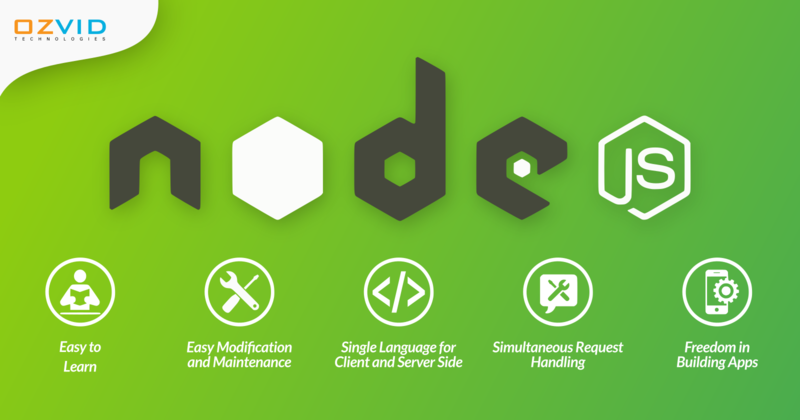 In short, NodeJS is the one-stop-solution for all the NodeJS development service companies as it allows you to reduce the programmers to build a new product, decrease the page load time by half, retain employees for a longer time, and keep customers as well as developers happy.